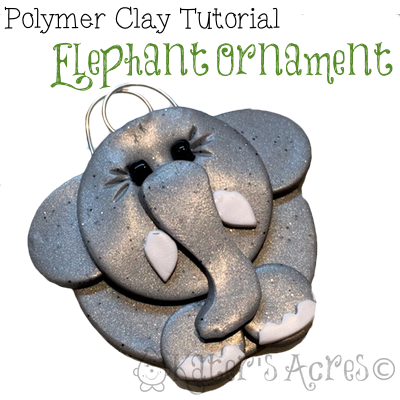 This cute little elephant ornament is perfect for the holidays, gift giving, or for the elephant lover. Enjoy! Fully condition your 1/2 block Premo! clay. Roll your clay on the 2nd largest setting of your pasta machine. Stack the pieces as shown in the bottom left corner & as described below. Place the 1.25″ round down first. Place both teardrops going slightly over the sides with “points” toward the center. Place the 3/4″ round so its top and the top of the bottom round are on the same plane. Place the two smaller rounds directly underneath the “face” toward the middle. Using the scraps from your pieces, cut a trunk in the shape you’d like to fit your elephant. Place it on the top of the face round and hanging down onto the feet. Add white tusks (if you’d like) and some white toenails if you’d like. Bend some 18 gauge silver wire and place it on top of the ears, sandwiched between the head & body with a few drops of Bake & Bond to help hold it in place after baking. Add 2 glass seed beads for eyes. Bake your elephant for 45 minutes at 275 degrees. After your elephant has been baked add a coat of varnish if you choose.